In 2005 I was refused entry into the USA after it was belatedly discovered that I had overstayed my visa on a few occasions in the past. It was a devastating blow as Alaska had been my inspiration and sanctuary for over 25 years. It was also very inconvenient at the time because I had started guiding kayaking trips for the Whale and Dolphin Conservation Society, and there were clients waiting for me in Alaska. I had also just bought the kayak of my dreams and left it there along with all the other outdoor equipment that I had accumulated in Alaska. It came at a particularly difficult time in my life when I had to move out of the old family house where I had been based for many years, because it had been sold and was due for demolition. 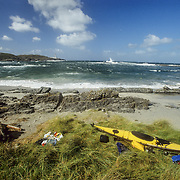 I desperately needed the solace of a kayaking trip so on my return to the UK I decided to do a kayaking trip on the west coast of Scotland. I had been there in 1990 on behalf of the Whale and Dolphin Conservation Society, did some kayaking, and really loved it there. The first obstacle was that I didn’t have a kayak in the UK, but miraculously I found a Feathercraft folding kayak being auctioned on eBay. Feathercraft folding kayaks are made in Vancouver, Canada, and are probably the lightest and strongest folding kayaks in the world, and also the most expensive because of their high quality, and certainly very difficult to find second-hand. So I was overjoyed when I won the auction for the “Kahuna” model, which is a slightly smaller model than the one that I had left in Alaska. I took the scenic train journey to Oban and from there the ferry to Tobermory on the Isle of Mull. Through my connection with the Whale and Conservation Society I managed to link up with members of the local Hebridean Whale and Dolphin Conservation Society in Tobermory, who kindly assisted me with preparation for my kayaking trip, and in return I did some voluntary work for them, and presentations in some of the primary schools on the islands.